Computer hackers are people who gain remote access (typically unauthorized and unapproved) to files stored in another computer, or even to the operating system of the computer. In the 1950 and 1960s, hackers were motivated more by a desire to learn the operating characteristics of a computer than by any malicious intent. Indeed, in those days hackers were often legitimate computer programmers who were seeking ways of routing information more quickly through the then-cumbersome operating system of computers. Since then, however, computer hacking has become much more sophisticated, organized, and, in many cases, illegal. Some hackers are motivated by a desire to cripple sensitive sites, make mischief, and to acquire restricted information. In the late 1990s, several computer hackers attempted to gain access to files in the computer network at the Pentagon. The incidents, which were dubbed Solar Sunrise, were regarded as a dress rehearsal for a later and more malicious cyber-attack, and stimulated a revamping of the military's computer defenses. In another example, computer hackers were able to gain access to patient files at the Indiana University School of Medicine in February 2003. 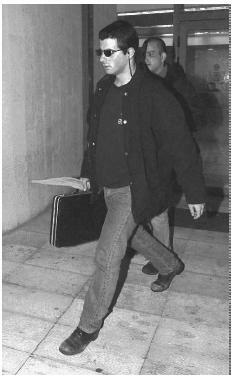 Ehud Tenebaum leaves a police station near Tel Aviv, Israel, under house arrest with two other Israeli teenagers in 1998 pending charges for the most organized hacker attack ever perpetrated on the Pentagon's computer system. U.S. government enacted the Cyber-Security Enhancement Act in July 2002, as part of the Homeland Security measures in the wake of the terrorist attacks on September 11, 2001. Under this legislation, hackers can be regarded as terrorists, and can be imprisoned for up to 20 years. One tool that a hacker can use to compromise an individual computer or a computer network is a virus. Depending on their design and intent, the consequences of a virus can range from the inconvenient (i.e., defacing of a Web site) to the catastrophic (i.e., disabling of a computer network). Within a few years during the 1990s, the number of known computer viruses increased to over 30,000. That number is now upwards of 100,000, with new viruses appearing virtually daily. 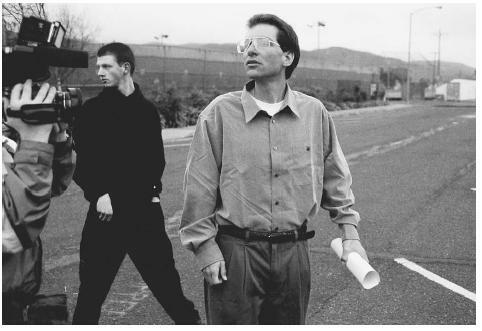 Convicted computer hacker Kevin Mitnick, right, after being released from the Federal Correction Institute in Lompoc, California, in 2000, remained under a judge's order barring him from using a computer for a further three years. system to make information more inaccessible to unauthorized access. McClure, Stuart, Joel Scambray, and George Kurtz. Hacking Exposed: Network Security Secrets and Solutions, 4th ed. Emeryville, CA: McGraw-Hill Osborne Media, 2003. Spitzner, Lance. Honeypots: Tracking Hackers. Boston: Addison Wesley Professional, 2002. Wang, Wallace. Steal This Computer Book 3: What They Won't Tell You About the Internet. San Francisco: No Starch Press, 2003. Warren, Henry S., Jr. Hacker's Delight. Boston: Addison Wesley Professional, 2002.